We offer a trip full of contrasts, for Madrid, capital of Spain and queen of Spanish cuisines and Barcelona, ​​the capital of Catalonia, the gateway to Europe and the Mediterranean Sea. Madrid, a city that never sleeps.The vibrant and modern capital of Spain, will surprise you with its majestic historical quarters and magnificent avenues, monuments, gardens, and large variety of cultural activities and excellent taverns and restaurants. It is the European capital that has absorbed most regional cuisines of our country. Located on the shores of the Mediterranean , Barcelona is a cosmopolitan city with great cultural significance both commercial , financial and touristic . Barcelona is one of the most popular European cities , but not only for his art, but also for its sunny beaches combined with a suggestive and excellent cuisine. 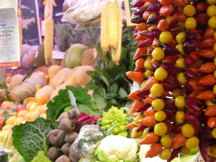 During these days you will have a cooking class in both cities to learn the Madrid and Catalan recipes, tasting the peculiarities of each cuisine. 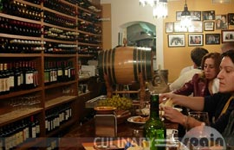 You will have fun in authentic tapas tours by discovering curious taverns and bars in the Gothic Quarter of Barcelona and Madrid of the Austrias historic centre. Learn from our expert guides on art Gaudí and about the Court and palace in Madrid history . We will also take you outside these capitals for Toledo, declared a World Heritage Site and known as the city of three cultures because Christians, Arabs and Jews lived together. Also visit the famous fishing and artistic village of Sitges. A culinary and cultural explosion…. This tour begins in Barcelona or Madrid. Private transfer from airport to our modern and centric hotel situated right in the centre. Welcome lunch or dinner at a charming restaurant in the heart of the city. Day 2 –B/L. Old taverns, tapas and cultural walking tour in historical old quarter. Your guide will meet you at the lobby of your hotel. From your guide will lead you on a private walk through some interesting sites which currently form part of what is known as the Madrid of the Hapsburgs, in the area surrounding the beautiful arcaded Main Square (Plaza Mayor) , the amazing Royal Palace, just in the beautiful Opera plaza, and visiting gorgeous bars and cheerful old taverns at the most famous tapas quarter, telling you fantastic legends of the history of Madrid. 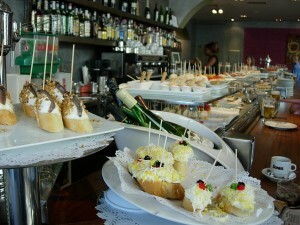 Of course we will visit The San Miguel Market, meeting point for friends to start a tapas experience. 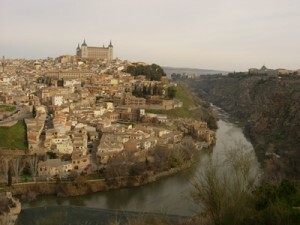 Just 33 minutes in high speed train AVE from Madrid, Toledo is a must visit. Toledo is one of the Spanish cities with the greatest wealth of monuments. Known as the “city of the three cultures”, because Christians, Arabs and Jews lived together there for centuries, behind its walls Toledo preserves an artistic and cultural legacy in the form of churches, palaces, fortresses, mosques and synagogues. This great diversity of artistic styles makes the old quarter of the capital of La Mancha a real open-air museum, which has led to it being declared a World Heritage Site. Your guide will explain to you the great history and legends of this magic place and will take you to savour the specialties of this region, Castile. We will finish the visit with the pleasure of trying the famous artisan “marzipan” of Toledo. A fresh sweet very tempting. Lunch at a typical tavern where you will taste the specialties. Rest of the afternoon free for shopping and back to Madrid. Dinner on your own. We will start the day visiting a local food market. Learn about our variety of fresh products, from hundreds of fishes, to different Iberian hams, cheeses and olives, a pleasure to your sight. Transfer to train station or airport for Barcelona. Transfer to your hotel and check in. Spanish omelette, with potatoes, onions and more Mediterranean ingredients. End of services. 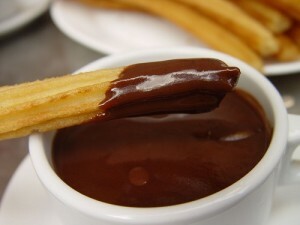 Culinary Spain wishes you a safe and happy trip back home. Flight or Ave train ticktet to Madrid or Barcelona. 6 nights in centric, charming and modern hotels. 3 nights in Madrid and 3 nights in Barcelona. (We will offer a range of different star hotel for you to choose. Private excursion to Toledo by train or minibus with English guide including meal with wine and entrances to Cathedral, synagogue, famous El Greco painting and and San Juan church. 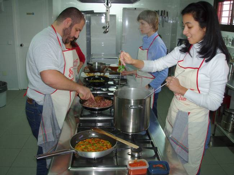 2 hands-on cooking class at prestigious cooking schools, 1 in Madrid and 1 in Barcelona, including meals with wine.